THE 15,000 SQUARE FOOT FACILITIES AT SKYDIVE ATLANTA ARE WORLD CLASS. 10,000 square feet of hangar space, creeping area, an accurate aircraft mock-up, and nearly 3,000 square feet of soft foam packing area. 6,000 square feet of office, air conditioned lobby, classrooms, and rigging loft space. We have an observation area with picnic tables and our aircraft loads just 50 feet from our hangar door. The main landing area is just another 100 feet in front of the aircraft loading area. At many skydiving facilities, to get to the aircraft you have to literally walk a hundred yards or even ride a bus to the airport! 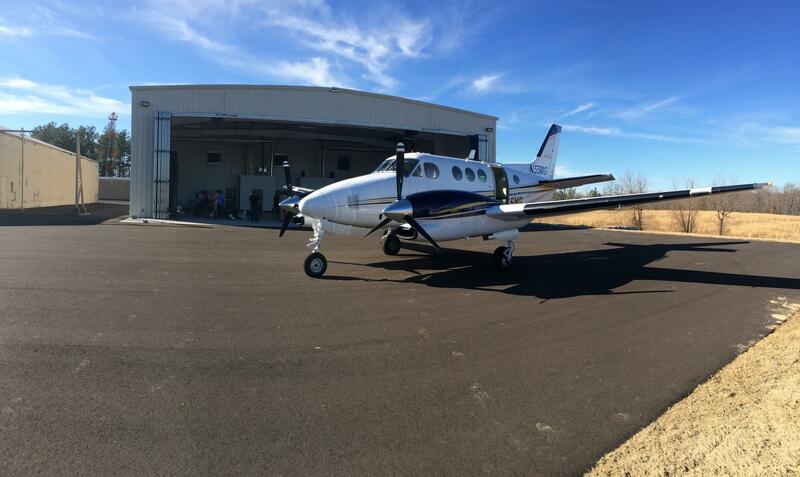 Our Beechcraft B90 King Air has twin, special PT6A-28 engines, rated at 715 SHP each engine. Most King Air jump planes have the smaller PT6A-20 engines. And most aircraft with our upgraded engines are only rated at 675 SHP. Our specially tuned engines will give you the fastest ride to 14,000 feet in the country, about 8 minutes average. Why is speed important? Well, when clouds or weather are a factor, our plane can get up, drop skydivers and be down in the time it takes other companies just to get up to altitude. This means we can often jump between the weather when others cannot. In addition, our King Air is equipped with onboard weather radar and a Traffic Collision Avoidance System (TCAS). Being located 50 miles from the world's busiest airport, TCAS is a must for safety. All airlines are required to have them, however, we have one of the only jump planes in the world with a TCAS. Our plane is meticulously maintained by FAA certified A&P and IA mechanics and adheres to the highest maintenance standards even though by law skydiving operators are not always required to do so.